Sometimes I read enough trending food articles and I will instantly go out and buy a series of ingredients to see if what they’re talking about it so damn true. 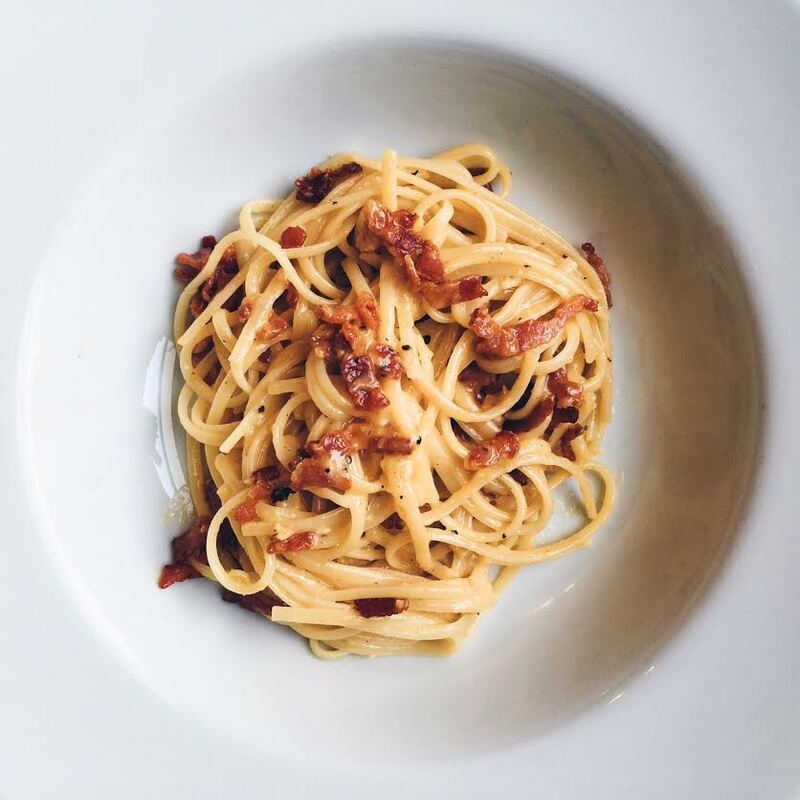 Recently I’ve been reading a lot about A Proper Carbonara, that doesn’t GOD FORBID have a drop of cream in it. Which…is never anything I gave much thought about to be honest, who hasn’t added a bit of double cream or crème fraîche to some pasta. Isn’t that normal? Don’t people do that? Am I wrong that I think that it’s yummy? Considering I’m about to marry someone of Italian decent…this is something I should know right? Also, do you know how much pressure there is to present Italian meal made in a bit of an impromptu mad kitchen moment to an Italian and be like: “This is how it should bloody taste like!” Pressure. So I had one of these impromptu “I Have To Cook Now” days and this is the result of me combining a couple of things from a few recipes I was nerding out on. Essentially what we are talking about here is that you only really need 4 basic but high quality ingredients: pasta, guanciale (or pancetta), cheese, and egg yolk. The actual creaminess comes from the delicious mixture of the egg yolks, cheese and cured meat fat. If you can’t get hold of the delicious cured cheek jowls of pork required, or even pancetta, I have actually substituted this for maple smoked streaky bacon in a pinch before and it was still delicious (shhh…don’t tell). In a heavy bottomed pan. Place the guanciale in with a little olive oil over low heat. Allow this to render out nice and slowly until nice and crispy. Turn the stove off when done, the heavy bottomed pan should keep it all warm for you. 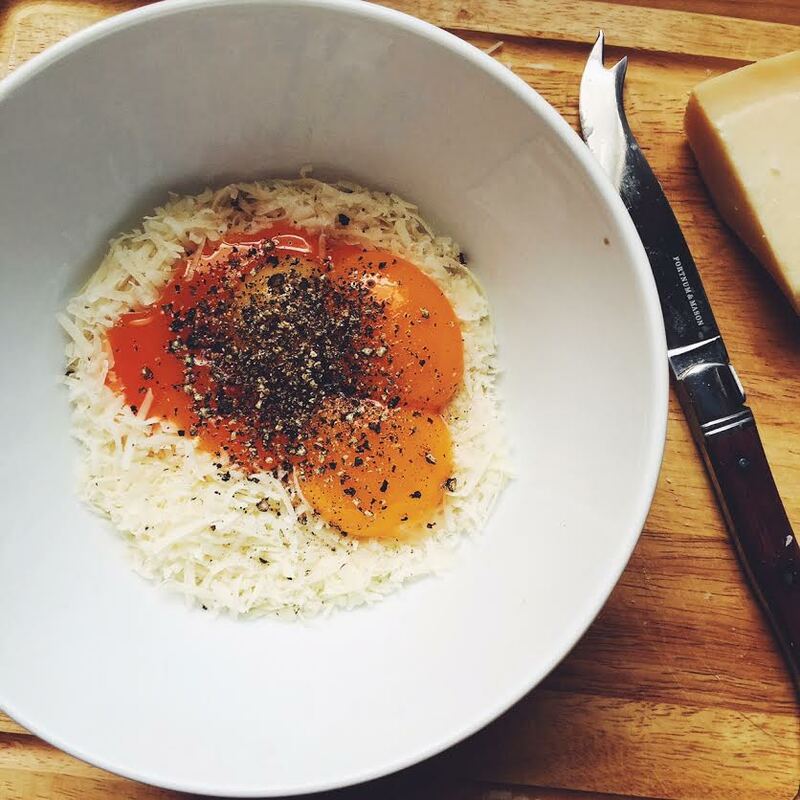 In a medium-sized mixing bowl, place the egg yolks, grated cheeses, and black pepper. Cook your pasta until al dente in salted boiling water. Add your cooked pasta into the mixing-bowl with the egg yolks and mix straight away. The residual heat from the pasta will melt the cheese and cook the egg yolks, forming your sauce. Magic! Now add your crispy guanciale and some of the rendered fat and keep stirring. You can adjust the consistency of the sauce with some of the pasta water, add more of the bacon fat should you need it. Adjust your seasoning. Serve and eat immediately with more grated cheese. I served this with a courgette salad and followed it with a Rather Boozy Tiramisu.